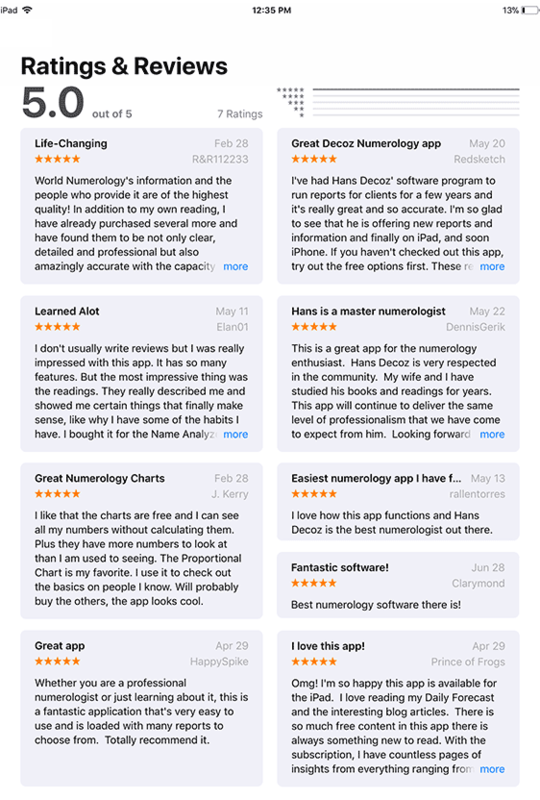 Access your personal numerology readings and charts across ALL your devices. We work on improving our World Numerology app every day of the week. If you have any suggestions or comments, please send us an email. We maintain a support page for our mobile app versions and for our desktop versions. If you have a question and don't find the answer there, please let us know. It has been some time since I last visited your site and I was amazed at what you offer. I have gone in the wrong direction for the past two years and lost a great deal of money in business ventures, I regret I didn't fully investigate your site before. Numerology has been my love and I should have pursued it. You give me new hope. Just a quick note from a frequent visitor. WOW! Loving it bigtime !! Thanking you so much for all of the tons and tons of information and guidance that is available on your numerology website. For a 7 like myself, you will completely understand the hunger for more answers to yet another set of questions. Indeed, the world numerology site is a doorway to the next level. In our quest to offer our customers only the most authentic content, Visionary Networks is proud to associate itself with Hans Decoz, the world's most experienced developer of accurate and in-depth numerology reports. Thank you for replacing my numerology software. I am impressed that although I purchased the software more than 4 years ago, you shipped free replacement copies immediately following my cry for help. I will make backup copies to prevent losing them again with the next crash. Thank you so much. It is very unusual to get this kind of service anymore. I would like to add my praise to the already long list of individuals appreciative of your work. The personal numerology reading and compatibility reading I received from you are uncannily accurate. I have never encountered a personality assessment with as much precision, depth and helpful information for myself and for my relationships. I have no doubt that my life has been changed significantly for the better due to the new insights I have gained from your readings. We both use all of the numerology programs in our daily lives and find them to be very accurate. I had tried many programs before I found yours Hans. Yours are so accurate! I'm sure your told that every day. Keep up the great work! I don't believe in any one of these pseudo sciences, but my wife gave me a reading done with your numerology software. I have to admit, I don't know how you do it, but you got me right on. Not only that, I feel reading it helped me confront some issues I always knew where holding me back. Thank you. From the bottom of my heart: Thank you very much. I love your numerology software. Especially this upgrade. It is better than any of my astrology programs (I own 3), and less expensive too! My husband and I read our numerology readings last night and we are very impressed. Your reports are comprehensive and accurate. We have ordered numerology and astrology reports before, but yours are much more specific than anything we have ever seen. We are enclosing an order form for 3 more readings for our sons. As a professional astrologer with little interest in numerology, I was hesitant to order a numerology reading. However, my friend Ariel raves about you, so I did order a personality profile. Congratulations Mr. Decoz. I am not easily impressed, especially with computerized reports. I don't know how you did it, but your reading pretty much blew me away. I sensed in your reports intelligence, a deep understanding of numerology, and real integrity. It is hard to believe your reports are done by computer. Please send me information about your software. I have studied numerology for over 10 years. I own 2 numerology software programs from different companies. I wish I had seen your software earlier. I would not have wasted my money on the other programs. Your version is better than anything I have seen. There is no comparison. Please let me know when your version with daily forecasts becomes available. Thanks! By the way, I just love your program! I ran one off for my son and he said it was excellent and wanted me to run one off for his ex-girlfriend, which he said was right on. I searched for a year for a good program and I felt yours was the best I could find. GOOD WORK! Have just done a numerology report on myself, to get an idea of what you have to offer. Impressive; to say the least. Far more detailed than the book I have been using so far. Hope that many people will benefit from it. I am in full agreement of the superiority and uniqueness of your numerology reports. It has been wonderful, accurate, and very informative. I am a professional astrologist and numerologist and I own two other numerology programs and three astrology programs. One of the astrology programs cost me more than a thousand dollars 3 years ago. All I can say, Mr. Decoz, is that your numerology software is so much better than any of the other programs, I really wish you had an astrology program as well. I must congratulate you on your work. I honestly cannot get over what I am reading in this material you offer. What is especially enlightening is information on my parents who I was estranged from since my young adulthood due to several factors, including theological differences. So much makes more sense to me now! Better late than never perhaps, but it would have been grand to show them why we were always in such disagreements over weighty issues and needs. I just want you to know that I'm very impressed with your system. I've dabbled in Numerology for many years feel very fortunate to have accidentally found your programs through the search tools. Thank you so much for your dedication to this specialized field. I recently finished reading your book Numerology; Key To Your Inner Self: A Complete Guide to Understanding and Using Your Numbers of Destiny. Wow. What a great book. This is the third book on numerology I bought. The first two were confusing and didn't make much sense. Your book saved me from dropping numerology altogether. Please send me information on your audio course and software programs. Thank you. Skeptical at first that my name and birth date alone could produce so much of interest, I am skeptical no longer. Your Numerology Reading I ordered has proven to be an infallible guide as well as an inspirational source of support and confirmation. You are by far the best in the world. Your reports are so accurate and so detailed. When my numerology chart was done by you, I was so shocked and surprised because I had no idea that numerology could or would be so accurate. AND of course, it depends on who is the "author." No one does numerology like you. We have ordered some readings and recommended it to friends too, and we are all so very, very satisfied with the readings - they are really great. We ordered personal profiles + forecasts. Now we want many more - for all of our families and friends. So then we thought of buying numerology software. I would highly recommend Decoz's software. It's extremely fair priced, very accurate, and more complete than any other numerology program I have seen. Hans Decoz is great to deal with and very helpful. The Readings are very detailed and in-depth and everyone who receives one is definitely pleased from first site of them. The software is very easy to use and works great. I have read your book and used your free software for my personal use for several years. Your work is awesome and you guys are terrific!!!! Look forward to receiving and working with the professional numerology software. However, when I downloaded and ran a report with your free Numerology software I WAS FLOORED! I had to pause periodically in AWE and got very excited at the ACCURACY and RELEVANCE of the information provided by your report. I have NEVER read a numerology report that hit the nail on the head as accurately as yours. Mr. Decoz, your advice regarding my adopted son Terry, was a life saver. Thank you so much. My husband and I didn't know which way to turn anymore. We must have spent over $10,000 on therapy for Terry in the last 3 years. Your numerology reading told us more than we had learned in 3 years. We are very grateful and we have recommended you to many of our friends. I have been interested in astrology and numerology for over 20 years now. I find that the biggest challenge is in the interpretation of the data. This is something that just cannot be done in software unless a significant amount of time and effort has been accurately invested. After downloading the sample today and running the personal numerology report, I was astonished! The amount of detail and accuracy in the report is amazing. The scope of the report, from its profile of what has been, to its numerology forecast of what's to come, made me realize immediately the value of this tool. Hans, you deserve the big hug an smile I got a few hours ago! My landlady came over to me crying as she had lost her very expensive cell phone...so I offered a lost object reading...she was so excited as she wrote 9 numbers...that reading made an exact hit...finding her cell phone within 5 minutes! I am so thrilled! This information you are sharing, I believe, will be yet another tool to help others understand themselves and their relationships and possibly help to contribute to a more peaceful and loving world. I can see the numerology reports giving greater vision into the whole person..and will be quite useful! Thank you for your time and for being so accessible and so very helpful! I am so grateful to you for your dedication in this field! I have used your numerology programs for almost 4 years now and I have to say that the reports are awesome. Dead on in most cases. I have had your audio courses when they were just on tapes...and those are great too. I still refer back to them often. Thank you for creating a wonderful program. Just thought you should know. Thanks for all your hard work. I have just finished your numerology book and CD workshop and I must say that I am very impressed with the information which has been provided. I have been studying various aspects of Metaphysics, Para-Psychology and other forms of this field for many years and happened across your website while surfing. I am glad that I did. I use your site daily, reading your articles, etc. After searching long and tediously, this is the best numerology site I have found. I commend you on the difference you are making in people's lives with your knowledge and wisdom concerning numerology and related disciplines. You have certainly made an impact on me and not a few of my friends and loved ones. Yesterday I received my complete numerology report, I was really impressed with the accuracy and the way that information is going to change my way of life. Again thanks a lot. I know you keep hearing the same thing but I must tell you that I Love your numerology reports very much. I'm a very skeptical individual and can't help but ask myself how your numerology program works. I've tried reports on several members of my family and find the results very intriguing. I will enjoy trying to figure out how and why your program seems to get it right most of the time.